Beyond Bunnies, Baskets, and Egg-Hunts. Easter can be a tricky holiday for parents, teachers, and churches. On the one hand, we all know it’s important to explain that there’s more to Easter than just bunnies and baskets. On the other hand- we don’t want to scare children as we describe beatings, crucifixion, & the death of Jesus. It’s certainly EASIER to skip the hard parts and just focus on the fun of Easter morning (who doesn't love a good egg-hunt?). However, this is one of those instances where we firmly believe that the truth is too important to skip over. Children can HANDLE the truth of Easter if it’s presented in an age-appropriate way. Whether you're an expert on the events surrounding Easter or not, we have included everything you need to teach it with conviction, passing the messages of hope, love, and patience on to your students. 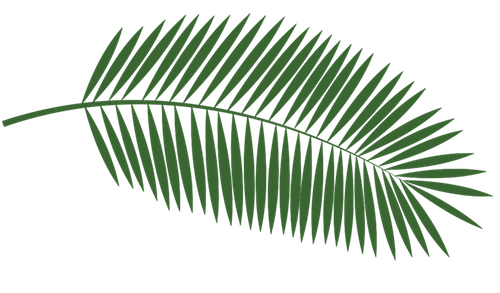 These lessons give you a chance to celebrate for three weeks - including the week before Palm Sunday - and learning all the important messages surrounding each event. 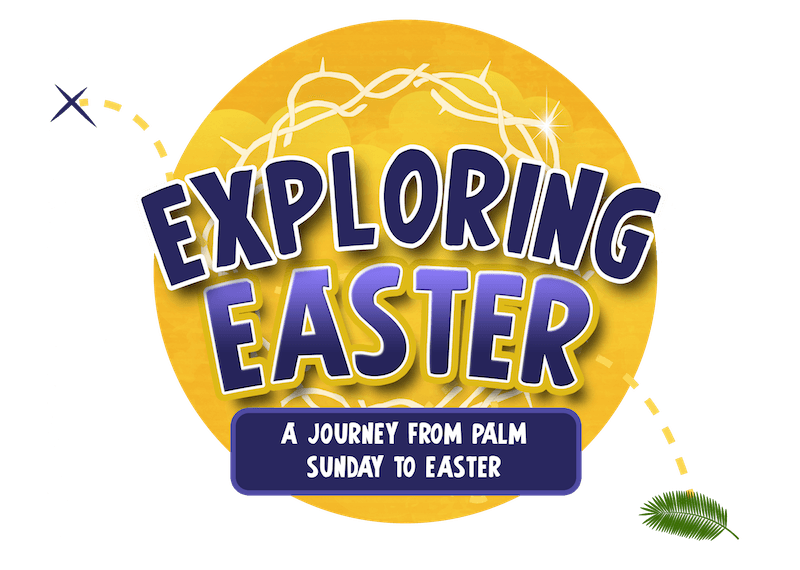 Students will learn of the importance of Palm Sunday, Jesus withering the fig tree, the Last Supper, Jesus’ arrest in the Garden of Gethsemane, the trial, crucifixion, and resurrection. For each Sunday we have provided a lesson, two printable puppet plays, discussion questions, a game, and a craft. Typically, it takes about an hour to run through the lesson and both activities each week. The lessons not only teach children to appreciate Christ’s death, but to get a better overall understanding of this most important celebration of our faith! This week we focus on Jesus making his triumphal entry and withering the fig tree. Our focus is to teach children that when they are disappointed they must remember that God probably has something in mind for them that is better than what they were imagining. This week, kids will learn about the Last Supper and what communion actually means! A lot happened during that meal, but we have focused on the betrayal, which kids can relate to in their own lives. They will also relate well to feeling too “tired and lazy” to do the right thing – watching the disciples battle with their flesh while their master was in such desperate need of support. This week we focus on the trial, crucifixion, and resurrection. Kids will see that Jesus’ death was very sad, but his resurrection made everything grand until this day. All Christian parents want their children to understand the real meaning of Easter. 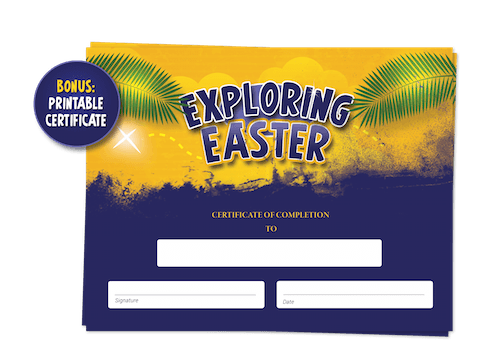 Use our printable Certificate of Completion to show them that their children have learned the important events and details surrounding Easter. Kids will BEAM as you present them there certificate for a job well done. The certificate prints out on standard 8.5 x 11 inch paper, and you can just fill-in-the-blanks with your students' names. As always- print as many copies as you need! 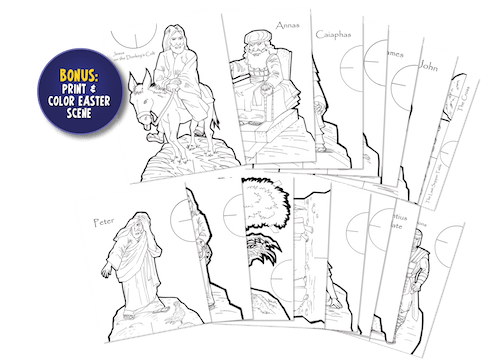 Our Print & Color Easter Scene is a wonderful tool for teaching children about Jesus' death! Have kids color and cut out each piece and use our printable stands to display the full 14-piece Easter scene! Each piece of the scene doubles as a printable puppet that can be used when teaching the individual lessons! Church use Idea: Have each child color & cut one image from the scene and compile everyone's contribution into a display for your classroom. Home use Idea: Have children color a few images each week to add to your scene. By Easter, the whole scene will be complete! Print as many copies as you need, year after year. Print Out As Many of the Certificate & Easter Scene as You Need. Year-After-Year. As soon as your order is securely processed, we’ll direct you to a download area, where you can get instant access to the complete lesson pack & bonus material. 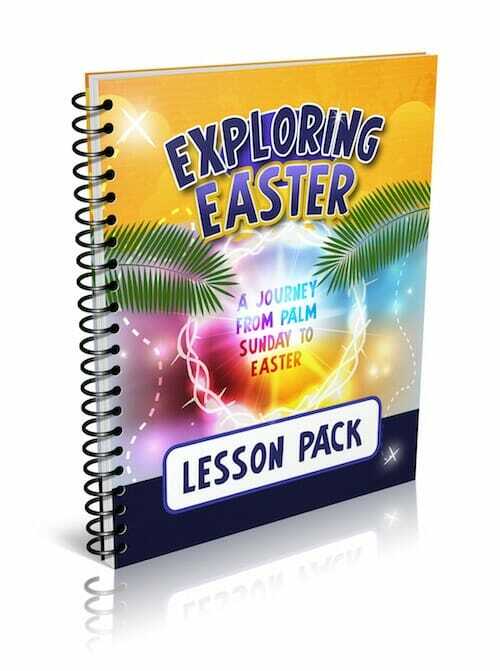 We are so sure that you will love the Exploring Easter Lesson Pack that we are offering an unconditional 100% money-back guarantee. 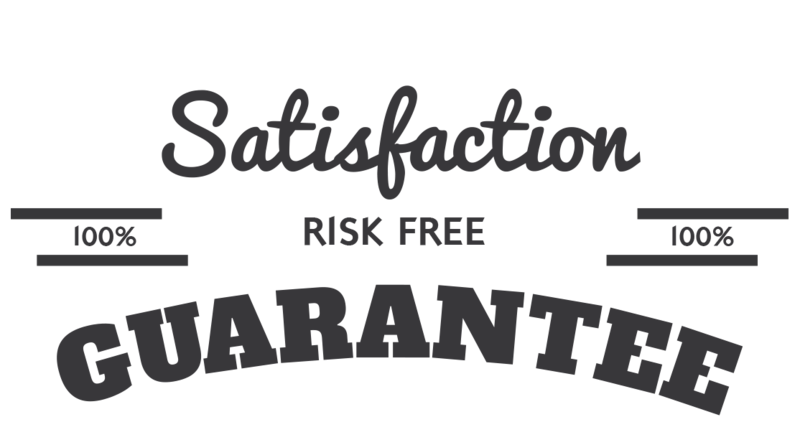 If you are not completely satisfied with the material, all you have to do is notify us within 60 days of your date of purchase and we will refund your money, in full, with absolutely no questions asked! YES, I want in! 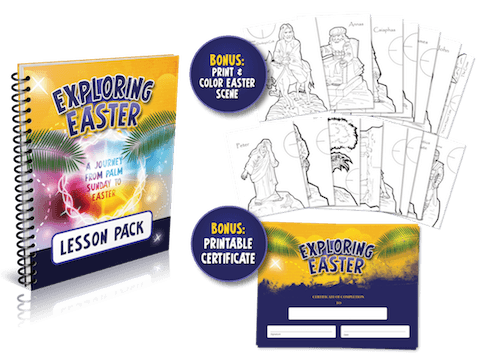 I want access to the "Exploring Easter Lesson Pack" PLUS the Bonus Printable Certificate and Printable Easter Scene. Please give me INSTANT access right now! Here's what to do to order… Have your MasterCard, American Express, Visa or PayPal account ready, and click the pretty orange button below to continue… Your lesson pack is waiting for you! Just $9 gets you instant digital access so you can start using these activities right away! Our lessons and activities are geared for kids ages 4-12. The material is equally effective with mixed age groups or single age classes. Do You Lessons Cater to A Specific Denomination? Our lessons can be used by churches of all denominations, as the topics covered are truly basic to the Christian faith. In addition, any Bible translation can be used. How Much Prep Time is Involved? Each lesson was designed to be taught after only 5-10 minutes of “prep time”. You don’t need to go around collecting craft materials or spending an hour before class getting organized. You can literally “print & go”. Are The Lessons for Home or Church Use? Both! We provide plenty of options and suggestions to make the lessons work in just about any setting- regardless of the number of children you are trying to inspire. They work equally well in large Sunday School classes and small single child homeschooling family settings.